In a 2017 pivotal trial, IDx-DR was tested at 10 sites across the United States on 900 patients with diabetes. - Representative sample of the 30 million people with diabetes in the U.S. In the clinical study, the IDx-DR system was able to achieve high performance when compared to wide-field stereo fundus imaging by Fundus Photograph Reading Center certified photographers using the Early Treatment of Diabetic Retinopathy Treatment Study (ETDRS) severity scale as the reference standard. Each study site identified one or more in-house operators who did not have previous experience in ocular imaging. The novice operators then underwent a one-time standardized four-hour training program. Despite the inexperience of the trial operators, they were able achieve high image throughput during the trial with IDx-DR's image quality feedback, which allowed them to immediately reimage the patient if the initial image was flagged as poor quality. - Any patient who self-reports visual symptoms; including vision loss that cannot be corrected (e.g., with eye glasses), blurred vision, or floaters. - Diagnosed with macular edema, severe non-proliferative retinopathy, proliferative retinopathy, radiation retinopathy, or retinal vein occlusion. - History of laser treatment of the retina or injections into either eye, or any history of retinal surgery. o Recently underwent photodynamic therapy (PDT), a type of phototherapy used to elicit cell death for treatment of disease, including age-related macular degeneration. Photodynamic therapy involves injection of the intravenous drug vertoporferin followed by low power infrared laser to treat abnormal blood vessels in the eye. - IDx-DR is only designed to detect diabetic retinopathy. IDx-DR is not intended to detect concomitant diseases, ophthalmic or other systemic diseases. Patients should not rely on IDx-DR for detection of any other disease. - Patients with an IDx-DR output indicating diabetic retinopathy should be immediately referred to an eye-care provider for further screening and treatment that is consistent with the recommendations of appropriate professional societies. In cases where the IDx-DR test provides no result, the patient should always be immediately re-tested or referred to an eye care provider. In cases where the IDx-DR test does not detect the presence of referable disease, the patient should be strongly encouraged to test again at an appropriate point in the future. - People with diabetes may be at elevated risk of glaucoma and should be seen by an eye care provider for glaucoma screening in accordance with recognized patient management recommendations. IDx-DR does not screen for glaucoma. 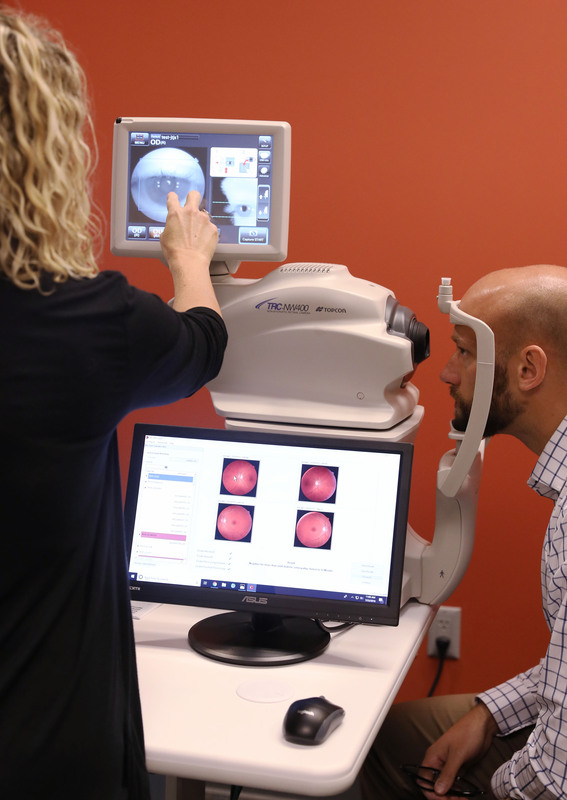 - Patients should be informed that IDx-DR does not treat retinopathy and that their images are analyzed to determine whether further examination is needed by an eye care provider. Physicians should review IDx-DR results and advise patients of recommended referrals to an eye care provider for evaluation and potential treatment. - If IDx-DR is not able to generate a detection result on a patient who has been pharmacologically dilated, the patient may have vision threatening diabetic retinopathy, or other abnormalities including cataract. Such a patient should be seen by an eye care provider for evaluation. - Patients should be advised to immediately report to an eye care provider if he/she experiences vision loss, blurred vision, floaters or any other symptom as these symptoms require the immediate attention of an eye care provider. - Do not use IDx-DR to screen for diabetes mellitus – IDx-DR is only for use in people already diagnosed with diabetes mellitus. - It is important for you, the user, to be aware of the limitations of IDx-DR. IDx-DR performs computerized interpretation of retinal images. IDx-DR will miss retinopathy in some cases (false negatives), and erroneously flag retinopathy in others where there is none (false positives). - IDx-DR is designed to work with good quality, in focus, digital retinal color images of the fovea and disc. Do not submit retinal color images that are of poor quality, retinal color images that were not made with the Topcon TRC-NW400 digital fundus camera, retinal images that are not in color, images of other tissues or objects other than the retina, or color images that were obtained by scanning images. - IDx-DR is only intended to be used with images acquired with a Topcon TRC-NW400. Refer to the FDA approved label of the Topcon TRC-NW400 for relevant contraindications, warnings, and precautions- Pharmacologic dilation (mydriasis) using a Tropicamide 1.0% solution may be required to capture sufficient quality images in some patients. Refer to the FDA approved label of Tropicamide 1.0% for relevant contraindications, warnings, and precautions. - The user is responsible for ensuring that the corresponding images and filenames for a particular patient are labeled appropriately to avoid mistaken identity with respect to IDx-DR results. - Users should regularly ensure that IDx-DR Client software is operating on a computer that is free of viruses or malware, and is updated with the latest security patches.